The next week we read Eric Carle’s Little Cloud and then went outside to see what shapes we could see in the clouds. Another winner, the kids loved it. With some classes we had time leftover to draw some pictures of cloud shapes. And then this week we finished up with Laura Numeroff’s Dogs Don’t Wear Sneakers, which is a segue into the Laura Numeroff author study we’ll be doing in November and December. Because of all the upcoming holidays it takes that long to get through all the If You… books and make our own circular stories like last year. Anyway, we’re reading Dogs and picking stuffed animals from the library’s collection to use in our own made up stories. The kids try and think of something ridiculous for their animal to do, just like in the book. And we finish by making drawings of the scenes we imagined for our animals. 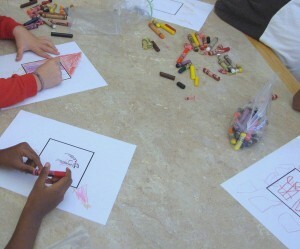 It’s been great fun, and the kids have made some great artwork in the library this month.